The FL-800 series has been discontinued. Please see the FL-2000 series as a possible alternative or contact our Flow Engineering department. 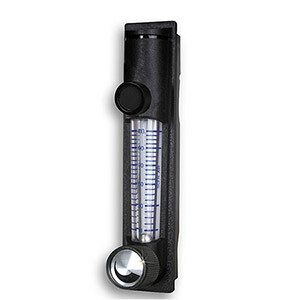 OMEGA’s FL-800 molded flowmeter is available with 24 different air and water ranges. This unit is supplied with scales in LPM Air, SCFH Air, CC/M Water and GPH Water, all with 10:1 turndown ratios. Molded of high impact polycarbonate, the FL-800 series has been designed to maintain maximum pressures to 100 psi at 21°C (70°F) and temperatures to 66°C (150°F) at 0 psig. The standard unit is supplied with a black body. These flowmeters are fitted with 1/8" FNPT inlet and outlet connections. An optional control valve and 304 SS construction are available. For units with valves, add suffix "-V" to model number, add $9 to price. For units with no valve and 304SS end fittings, add suffix "-SS" to model number, add $5 to price. For units with 304SS valve and end fittings, add suffix "-VSS", add $16 to price. NIST Certificate is not available.